Various types of red wine are gaining in popularity. 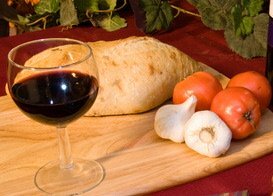 But unlike white wine, most reds are usually consumed with food, rather than just by themselves. The color of red wine comes about because of winemaking techniques. In order to make red wine, the juice is kept in contact with the red skins of the grape during fermentation. Often techniques include keeping the grape juice in contact with the seeds and stems of the grape as well. This combination gives red wines their boldness and tannin flavors. Styles of red wine vary considerably from one another. One style is light-bodied and fruity. It doesn't have much tannin flavors, those flavors that remind us of eating walnuts or drinking strong tea. An example of this type of red wine would be an Italian Valpolicella. Another style of red wine is one with mild fruit flavor and medium-bodied. These wines do not have strong tannin flavors. Examples of these types of red wine are some French Bordeaux. Still another style is one where the wine is quite spicy and full of flavor. They also have tannin and are medium to full-bodied. Examples of these types of wines are Malbecs and also Zinfandels. Then we have the bold style of red wine. these wines are full-bodied and have a strong tannin flavor. Cabernet Sauvignon is a great example of these types of red wines. The most popular red wine is Cabernet Sauvignon. People love its strong presence and bold flavor. It is almost as popular as Chardonnay. Next in popularity in the red category is Pinot Noir. This wine is at the other end of the flavor spectrum. While Cabernet is bold and full-bodied, Pinot Noir is milder and subtle. Some consider it the perfect food and wine pairing companion, because it goes well with many seafood as well as red meat dishes. Merlot is another favorite. It is medium-bodied; smooth yet rich. It pairs quite well with many foods, and has become very popular in the past few years. Merlot is also often blended with other wines because of its texture and versatility. Also popular, particularly when paired with spicy foods, is Zinfandel. If you are going to have wine at a barbecue, Zinfandel is a good candidate. The spiciness of the wine pairs well with the spiciness of the food. We want to know about the wines you love. Take our survey by going to Wine Recommendations and tell us which is your favorite wine.